Soundarya: I do hope 'Kochadaiiyaan' will be a game-changer for Indian cinema on a global level. Rajnikanth is cast as the archetypal superhero in the epic dramatisation of good versus evil. Megastar Rajnikanth’s daughter Soundarya hopes her directorial debut vehicle ‘Kochadaiiyaan’ to be a game-changer for Indian cinema at the international level. The veteran actor’s most talked about film, set to be released in six languages, is being touted as the country’s first to be made using motion capture technology. The film is helmed by Soundarya, who is also making her directorial debut with this project. “I have been passionately involved in film animation techniques and production for the last six years and for ‘Kochadaiiyaan’ we wanted to do something unique and decided to do this with the use of Motion Capture technology which was never attempted in its full bandwidth in India before,” Soundarya said in a statement here. “The technology captures the essence of actor’s performance and also allows unlimited creativity on all grounds from creating character’s looks, building lavish sets, directing expansive fight sequences and creating elaborate costumes. I do hope ‘Kochadaiiyaan’ will be a game-changer for Indian cinema on a global level,” she said. Referred to as India’s answer to James Cameron’s ‘Avatar’, the director has explored the use of full performance capture in the film in its full magnitude. Apparently, this technology has been used so far in big-budget Hollywood films such as ‘Avatar’ (2009), ‘The Adventures of Tintin’ (2011) and ‘Beowulf’ (2007). storytelling and bring to life mythological India. dual role with Bollywood actress Deepika Padukone being paired opposite the younger character. They are joined by current and yesteryear stars of North and South Indian Cinema such as Jackie Shroff and R Sarathkumar for a global, pan-Indian cinematic treat. 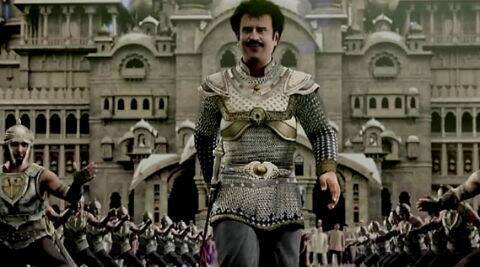 ‘Kochadaiyaan’ is set to release on April 11.